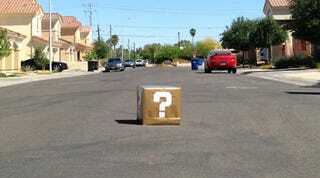 I don't blame police in Tempe, Arizona for calling in the bomb squad to examine this "suspicious package" they found on the street today, as reported by news network KTVK. And, yeah, I guess it's for the best that they sent in a robot to try to detonate it. After the events in Boston this week, it's better to be safe than sorry. But... still. I mean... come on.